You’ll have a dating scan between about 10 weeks and 14 weeks of pregnancy. For most mums-to-be, this is their first scan. You’ll only have a scan before this, between six weeks and 10 weeks, if you’ve experienced bleeding, pain, or problems in a previous pregnancy. You’ll also be able to have an earlier scan if you’ve had recurrent miscarriages. A dating scans is the best way to predict your due date. The point of the scan is to work out how many weeks pregnant you are. You may have calculated the length of your pregnancy from the first day of your last menstrual period (LMP). However, conception doesn’t actually occur until around 14 days after your LMP, or later if your cycle is longer than 28 days. You may know when your LMP was, but not when you actually conceived. If you do know the conception date, this is counted as day 14, not day one. If your cycle is irregular or you’ve recently been on the pill, working out the date from your LMP probably won’t work. A dating scan is more accurate. If the scan date differs from your period dates, the scan date will be used. The scan will usually show that your pregnancy is less far along than suggested by your LMP. This means that accurate dating reduces your chance of having your labour induced because your baby is thought to be overdue. It may also help you to avoid feeling disappointed towards the end of your pregnancy if you think your baby is late when he’s not. What else will the dating scan reveal? The scan can check that your baby’s heart is beating nicely and that he’s developing normally. Your baby’s head, limbs, hands, and feet can be seen, as well as his abdominal wall and some organs, such as his stomach. The dating scan isn’t designed to look for more subtle abnormalities, though. That will happen at your next routine scan at about 20 weeks. By then, the sonographer will be able to see your baby in more detail because he’s bigger. However, some major problems can be seen at your dating scan, such as issues with the umbilical cord or with your baby’s skull or abdominal wall. You may need a second scan to check the first scan’s findings. The dating scan will also show if you’re expecting twins, triplets, or more. It’s helpful to know about twins early on, and it’s easier to see whether or not they share a placenta during the first trimester. Finding out about having twins early in pregnancy also gives you more time to prepare for the birth and for your doctor to plan your care. What happens at a dating scan? The dating scan usually takes about 20 minutes. Nearly all scans after 10 weeks can be done through your tummy, and most units ask you to arrive with a full bladder. The sonographer will put some gel on your tummy and move a small hand-held device (transducer) over your skin to get views of your baby. It won’t hurt, although you may feel a little pressure on your tummy. If your womb (uterus) is very deep in your pelvis, or if you’re overweight, you may be offered a vaginal scan, which can get a closer view of your baby. It shouldn’t be uncomfortable, and you don’t need a full bladder. Your sonographer will give you a report of the scan, which will tell you exactly how many weeks pregnant you are. Keep it with your maternity notes so your doctor and anyone else involved in your care can see it. How big will my baby be at the dating scan? After 13 weeks, your baby can curl up and stretch out, so measuring the length becomes less accurate. Therefore, from 13 weeks, or if your baby is longer than 84mm, the circumference of the head becomes the best way to measure your baby. Can I have a screening test at the same time? Most units offer a screening test for Down’s syndrome and other conditions at the same time as the dating scan. Screening for Down’s syndrome involves a nuchal translucency (NT) scan plus a blood test. This is called the combined screening test. Foresight Prenatal is the only maternity clinic in Bangladesh at the moment to offer NT-Scan. You can have the combined screening test from 11 weeks to 13 weeks plus six days, or when your baby’s CRL is 45mm (1.8in) to 84mm (3.3in). As long as the timings are right, you can have the NT scan and blood test at the same appointment as your dating scan. But you’ll have the dating scan first. That’s because the screening test needs an accurate due date to be reliable. Hormones in your blood vary according to your stage of pregnancy. A blood test at what you thought was 13 weeks wouldn’t be helpful if you were actually 16 weeks pregnant. It may lead to you being given a high chance for Down’s syndrome, when your baby is actually developing normally (false-positive result). A combined (NT) scan and blood test is available on the NHS in England, Scotland and Wales. In Northern Ireland, you may be offered the combined test on the NHS, or you may have to pay for it privately. If you prefer, you can have a private screening test. As well as the combined test, most private healthcare clinics offer non-invasive prenatal testing (NIPT), which is the most accurate (up to 99 per cent) screening test for Down’s Syndrome. Foresight Prenatal Clinic is the first maternity Clinic in Bangladesh to offer NIPT screening test. Are there any disadvantages to having a scan? 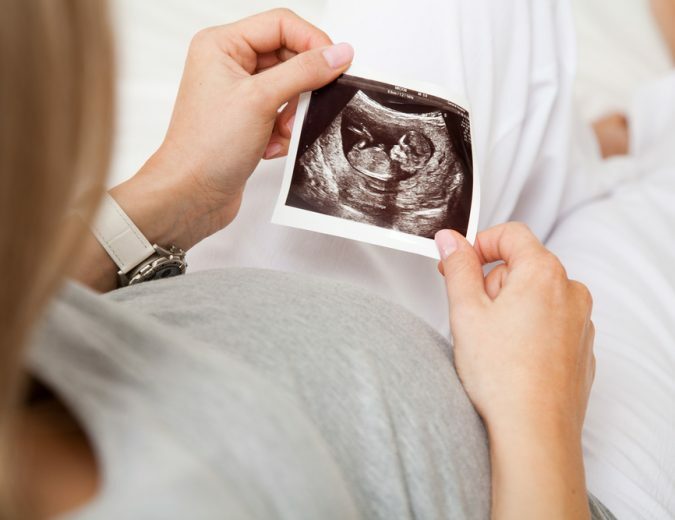 Ultrasound scans are considered to be safe for you and your baby when performed by trained professionals. However, sometimes, having a scan can cause unnecessary worry. It may show a very minor problem, or something that may get better on its own. As with all screening tests, there can be false-positive and false-negative results. For example, the NT scan for Down’s syndrome has a false-positive rate of five per cent. This means that, out of 20 women who have the scan, one woman will be wrongly told she has a high chance of having a baby with Down’s syndrome. It’s entirely up to you whether or not you have a scan. You could have a dating scan without NT screening, or even change your mind on the day of your scan. Your sonographer should support your decision, either way.